Eight California native species now home in the all-new upcoming California Trail including Grizzly / Brown bears, Gray wolves, California Condors, Mountain Lions, Black bears, Jaguars, Bald eagles, and now 24 buffalo – 10 unexpected calves have been born since their mothers’ arrival in April. Almost three years since breaking ground and more than two decades in the making, Oakland Zoo’s highly anticipated California Trail opens to the public on July 12, 2018. The expansion more than doubles the Zoo’s current size from 45 acres to 100 acres. Eight new native California animal species, each selected for their historical significance to our state and status in the wild, have settled into their expansive new habitats – among the largest in the world and designed under the collaboration of animal behavior experts, wildlife experts, and notable habitat design experts. These species are American buffalo, Black bears, Grizzly Bears, Brown bears, Mountain lions, Jaguars, California condors, Gray wolves and Bald eagles. California Trail is accessed by 24 eight-passenger open-air gondolas - ADA-accessible, and all-electric - custom-made by Austrian-Swiss Company, Doppelmayer. The gondolas transport guests on a four-minute ride up and over the rolling hills of Knowland Park to the California Trail site from the main Zoo. There, at 650 feet above sea-level, the gondolas arrive at the 3-story Kaiser Permanente Visitor Center, which houses The Landing Cafe, a floor-to-ceiling glass-walled 176-seat restaurant serving artisan menu items not available elsewhere in the Zoo. An observation deck at the restaurant provides panoramic views of six Bay Area counties. Guests can enjoy chef-inspired cuisine while taking in breathtaking views. The California Trail also includes the interactive Clorox Overnight Experience ‘safari-style’ campground, the interactive California Conservation Habitarium, California Wilds! Playground, a one-of-a-kind play zone where children can mountain-climb, zip-line, and splash in five play zones inspired by the different ecological zones that the California Trail animals call home. The Conservation Society of California, managing the Oakland Zoo, has made wildlife and ecology conservation forefront to the California Trail through the stories of the animals and what we can do to ensure the survival of their counterparts in the wild. Many of the animals at California Trail come from rescue situations managed by the California Department of Fish & Wildlife, where re-release into the wild was not possible due to no chance of survival following rehabilitation. These animals would have been euthanized if suitable placements were not found. “The California Trail at Oakland Zoo is unique. Beyond the gondola ride, spectacular views, and our many rescued animals in their expansive habitats – this is about inspiring people to connect with our state’s remarkable biodiversity and how to live with wildlife so we can protect their futures,” Dr. Joel Parrott, President & CEO of Oakland Zoo / Conservation Society of California. Two Grizzly / Brown bear cubs, all orphans, and all males over one year of age arrived on May 25th. The bears’ mothers were unfortunately designated as ‘public threats’ and thus dispatched by Alaska Dept. of Fish and Game, creating the need to find a home for the cubs who would have otherwise been euthanized. The cubs could not be released back into the wild as they had learned the dangerous behaviors of their mothers and were expected to demonstrate them themselves. These four cubs came to Oakland Zoo from Anchorage, Alaska aboard a FedEx Express jet. The very special delivery is part of the company’s FedEx Cares “Delivering for Good” initiative. FedEx uses its extensive global transportation network and logistical expertise to deliver resources where they are needed most during times of disaster and for special shipments. The cubs were accompanied by Oakland Zoo’s President, Dr. Joel Parrott who also served as their attending veterinarian. They are now enjoying their new 2.5 acre habitat, complete with pool, waterfall, several dens and trees for climbing. The Conservation Society of California (CSC) / Oakland Zoo partners with the conservation organization, People and Carnivores, a Montana based organization aiming to increase co-existence and eliminate human-wildlife conflict through education and human behavior change. Two California Condors arrived on May 10, from the San Diego Zoo and the Oregon Zoo. A Condor specialist from U.S. Fish & Wildlife and the lead biologist from Oakland Zoo’s conservation partner, the Ventana Wildlife Society in Big Sur, were present to oversee their arrival and release into their new 17,945 cubic foot aviary. The birds, with a 10 foot wingspan, were once critically endangered with only 22 left in the wild. The Conservation Society of California / Oakland Zoo partners with the conservation organization The Ventana Wildlife Society to protect condors, and through the Condor Recovery Program, wild condors are tested and treated for lead poisoning and other injuries at Oakland Zoo’s LEED-certified Veterinary Hospital. They are then released back into the wild. Four female Bald eagles will arrive the week of June 25 from the Raptor Education Center in Wisconsin. All of these birds are rescues from the wild and unable to survive on their own. Two Gray wolves, Sequoia and Siskiyou, from the California Wolf Center , arrived in late December and animal keepers have been conducting ‘wolf acclimation training sessions’ for these many months with exposure to small groups of people to give them ample time to adjust to their new two-acre home. Born in captivity, these two wolves represent a much larger and inspiring story of wolf conservation in California. Wild wolves are now returning to California - after being extirpated during government-run antipredator campaigns a century ago. The hope is for the two to continue to bond are create a pack with their pups around Spring 2019. The Conservation Society of California / Oakland Zoo partners with the conservation organization the California Wolf Center to protect wolves in the wild, and sponsors their Range Steward Program in creating a positive relationship between conservationists, wolves, and ranchers. Two Jaguars, a 5-year old male from LA Zoo and a female from CSC / the Zoo’s conservation partner, ARCAS in Guatemala, will be arriving as early as this fall. This female is a wildlife rescue and while rehabilitated, cannot survive in the wild. She is in need of specialty veterinary services that Oakland Zoo can provide that cannot be performed in Guatemala. Wild jaguars long ago roamed the southeast corner of our state, and the hope is that this pair will bond and reproduce to diversify the genetics of jaguars in AZA-accredited zoos. Three Mountain lions cubs, two male and one female, were brought to the Zoo in December of last year by the California Dept. of Fish and Wildlife in very ill condition. Through the attentive care of Zoo vets and animal keepers, Toro, Silverado, and Coloma have grown healthy and strong over the past few months and have created a tight bond with one another in their new home – of which their hammock made of firehouse by animal keepers seems to be a favorite for lounging. 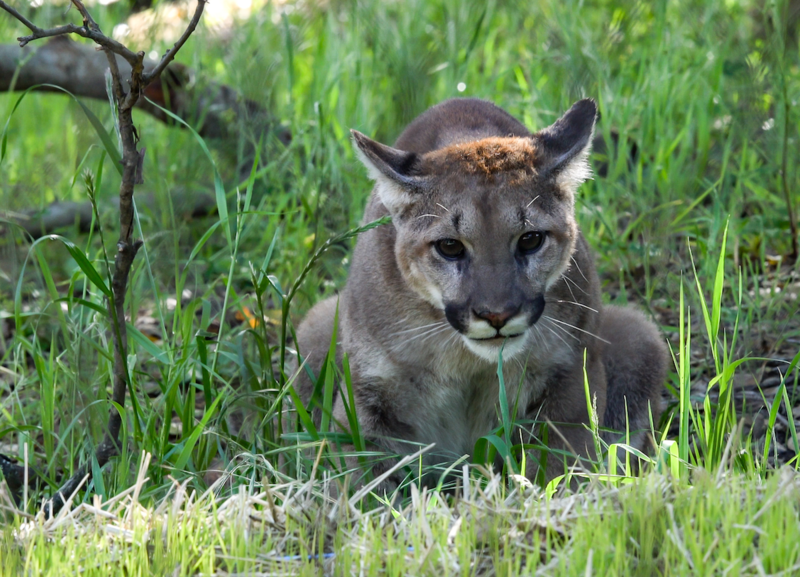 The Conservation Society of California / Oakland Zoo partners with the conservation organizations the Mountain Lion Foundation and the Bay Area Puma Project to help protect mountain lions in the wild. Our Black bear family, a mother and her three cubs, were the first to call California Trail their home in summer 2017. This mother Black bear and her three cubs were fed by humans when living in the wild and became accustomed and fearless of humans. Following an incident where the mother entered a home and inflicted human injury, the California Department of Fish and Wildlife (CDFW) picked up the bears and deemed the mother a public safety threat. Per the law, she was initially set to be euthanized by CDFW - her cubs also determined by CDFW to be ineligible for re-release as they were too habituated to humans. An exception was made by CDFW in this case, allowing them to be taken in by Oakland Zoo permanently. As with many other California Trail animals, these rescues were caught in the human-wildlife conflict. The Conservation Society of California / Oakland Zoo partners with the conservation organization The Bear League in Lake Tahoe to educate people on how to live sustainably with Black bears. TBL also responds to bears in human territory, rents the bear deterrent mats and facilitates a 24-hour hotline for bear sightings and encounters. Fourteen iconic (female) Buffalo, descendants of the historic Pablo-Allard herd which date back to 1873, were brought to California Trail by the Blackfeet Nation of Montana in mid-April. They currently enjoy 13 acres of rolling grassland and can be seen the gondola transporting guests to the California Trail. In order to diversify the genetics of this herd’s offspring, which will be sent back intermittently to Blackfeet land and to Glacier National Park, two male buffalo from Yellowstone National Park will join the females this Fall and the group will be allowed to breed naturally. The end-goal, termed the Innii Initiative by the Blackfeet Nation, is to restore a herd of a few thousand living in an open range setting on Blackfeet tribal land, Glacier National Park & Waterton National Park (Rocky Mountains area). An unexpected surprise came with the newly arrived females from Montana, in that many were pregnant. Ten calves have been born since their arrival, bringing the current herd to 24 buffalo. These 10 will return to Blackfeet land with future offspring of the Yellowstone males. California Trail represents $71 million out of an $81 million multi-phase Zoo development, 85% of which has been raised through private donors and Zoo operations. In 2012, a fully-funded LEED certified Veterinary Hospital opened, followed by the opening in 2013 of the Oakland Zoo Biodiversity Center, and the 2014 inauguration of the Condor Recovery Center at Oakland Zoo. Each of these projects has advanced care of the Zoo’s animals as well as conservation of the species in the wild, from mountain lions and condors to frogs and turtles, including life-saving research in partnership with local conservation scientists. California Trail will focus on California’s natural legacy; animals that have all but disappeared from our surrounding landscape – with the intent to inspire people to take action for wildlife and ensure their future in the wild. California Trail brings to life the rich natural history of California in a whole new way. Designed to be more like a wild animal park, California Trail will feature the state's historic and iconic animal species in large exhibits, including grey wolves, grizzly bears, jaguars, mountain lions, bald eagles, California condors, black bears, and American bison. Through the California Trail experience, Oakland Zoo presents a dynamic and inspiring story about finding balance in how we steward our state's natural legacy. Interactive features along the Trail will help to complete the animals' stories with a vision for their healthy future in the wild and opportunities for you to help them thrive.